This graphic depicts the launch profile for a Dnepr rocket. In anotherfrustrating foul-up on the path towards converting Soviet-era military missilesinto cash-paying satellite launchers, a military-industrial team in Moscow hasannounced the ?indefinite suspension? of plans to launch an earth resourcessurvey satellite for Thailand. The reasons: at the last moment, for the secondtime, overflight permission has been revoked by a country downrange of thelaunch site. 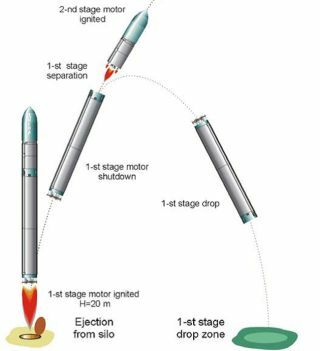 First Uzbekistan, and now Kazakhstan, denied permission fordropping the booster?s spent first stage onto their territories. ?We neverthought we?d see a repeat of the Uzbekistan case,?lamented Thongchai Charuppat, director of Thailand?s ?GeoInformatics and SpaceTechnology Development Agency (GISTDA)? which owns the European-built payload.The second denial, he added, was ?worse because the cancellation was made atthe last minute," even though "all functional systems were in placeand the rocket was fully fueled.? Therocket, a converted RS-20V ?Voyevoda? (Russian for ?war chief?) knownas the SS-18 ?Satan? to the Pentagon, had finished 25 years of alert dutyin 2005, and had been stored awaiting a more peaceful assignment. The countdownwas underway towards a launch at 1.37 p.m. Thailand time (2:37 a.m. EDT)on Aug. 6. Then the clock stopped. "We are waiting for the negotiation between the launch company (ISCKosmotras) and Kazakhstan," he told the newspaper Bangkok Post onAug. 7. "The problem is not with the satellite, which is now ready towork," he added. No other information has been released in Moscow, wherethe company?s website has not been updated in more than a year. In what hadlooked like a ?win-win-win? situation for all concerned, a Ukrainian rocketfactory had been acquiring old military missiles from the Russian ?StrategicRocket Forces? and adding an off-the-shelf upper stage to create a satellitelaunch capability that they then sold to foreign customers. The project, named?Dnepr? after the Ukrainian river, had already launched ten such vehicles intoorbit, mostly from rented facilities at the Russian government?s space base atBaikonur, now in independent Kazakhstan in central Asia. In order tolower launch costs even more, and to get more training benefit for the militarymissilemen, in the past several years launches had also been made from aRussian military missile base near Orenburg, east of the southern UralMountains. A testlaunch of a missile was made in December 2004 and orbital launchesfollowed. The problemwith the current launch — which could be either permanently unfixable, oralternately could be cleared up overnight by appropriate cash transfers betweenofficial and/or private Asian bank accounts — stems from the special orbitalpath of this particular satellite. The satellite, named THEOS (Thailand EarthObservation Satellite), needed to be in what is called a ?sun-synchronous?orbit around the Earth. In such apath, earth observation satellites maintain a constant angle to illuminatingsunlight over their observation regions. This is done by using a near polarorbit — traveling closely to a north-south or south-north track — with aslightly more ?retrograde? slant added in. That extra slant allows the Earth?sequatorial bulge to gently twist the orbital plane of the satellite to the eastabout one degree per day. This is the same rate that the sun moves against aninertial reference frame in Earth?s 365-day circuit. As aresult, the orbit ?keeps pace? with that daily shift and thus obtain surfaceimages month-by-month that have similar lighting conditions and can beprecisely contrasted to monitor real changes. All long-term low-orbit earthobservation satellites, military and civilian, use this kind of orbit. But to getinto such a path, the satellite must be carried not on the most efficienteastwards launch trajectory, but initially towards either the south or northpole. This crosses different regions of Earth, including some areas near launchsites that are unaccustomed to jettisoned rocket stages falling out of the sky.And it didn?t help that two years ago a launch of a Dnepr due south from Baikonurcrashed to Earth whenthe first stage failed, leaving a large crater and spraying toxic fuel overKazakh pasturelands. A subsequent early-in-ascent crash of a much-heavier?Proton? rocket the following summer did little to endear the Kazakhstangovernment to Russian rocketry. To launchfrom the other Dnepr site in Orenburg Province, an ascent path heading justwest of due south would have dropped the spent first stage — still containingsignificant amounts of leftover fuel — into a desert region of Uzbekistan. Butlate last year, the Uzbek government refused to grant permission. Althoughthe ?Kosmotras? company has released no information on what came next, itappears that its engineers redesigned the rocket?s ascent path, shifting itslightly to the right (or westwards) to move the planned impact zone intoKazakh territory, in the Karakiya District of the Mangystau Province in farsouthwestern Kazakhstan.Afterdropping the first stage, the rocket could then shift back onto its desiredtrack. This navigational method, called a ?dog leg maneuver? after the kink ina canine hind leg, is fairly common in rocket science, and it trades a slightdecrease in orbital payload capability for a much more environmentallyacceptable early ascent path. But now itseems that even the alternate ascent path is unacceptable, this time toKazakhstan government officials in Astana, the country?s capital. There couldbe any of a number of reasons, or a combination of them all. Perhapsit?s simply an issue of clean-up guaranties, or of insurance, or even ofprivate under-the-table payoffs — or perhaps it?s just national pride. Onlydays before the scheduled launch, a cynical article in the Moscow Timeshad criticized ?Moscow?s seeming indifference to Astana?s demands that Russianengineers and space companies drastically change launch procedures at Baikonurfor public safety and environmental reasons.? Outraged by the two recentcrashes in their countryside, the Kazakhs have demanded a rapid phase-out ofhydrazine-fuelled rockets at Baikonur, and although Moscow has signed anagreement to do so, it has made no move in that direction. Thearticle?s author, satellite technology expert Peter J. Brown, concluded thatdespite the fuss, ?Kazakhstan seems comfortable in Russia?s orbit,? hinting itscomplaints may only be for show: ?While Astana goes on shouting that the[hydrazine rockets] must go, its ties to Moscow remain firm.? In Astana,nationalistic officials may have seen the article — or sensed similarsentiments directly from among Russians they were negotiating with — andconcluded they had to get tougher to be taken seriously. Poor Thailand couldonly watch stunned as its grounded, but fully flight-worthy, observationsatellite became the club for Kazakhstan to beat Russia with. Anysolution to this impasse must be navigated on Earth, and not in space, wherethe trajectory rules are much less clear-cut and the mission trade-offs much murkier.